Making sure that your hot tub chemicals are dispersed evenly is an important responsibility for a hot tub owner. Improper chemical balance could lead to illness for those using the hot tub as certain bacteria can thrive. Improper chemical balance could also damage parts of the hot tub's system such as eroding heating elements and jet diffusers. It is a certain indication that the chemical levels need to be checked if a hot tub owner notices that bathers have changing hair color, red eyes, or skin irritation when using the hot tub. 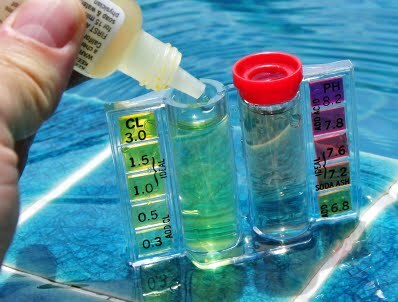 Hot Tub Warehouse offers a variety of chemical test kits (Liquid, tablet, and test strip) to help a hot tub owner be sure that his/her chemicals are well balanced. Choosing which test kit to use is as individual as the person who is going to use it. Each type of water test kit offers accurate results as long as they are used properly. The basic chemicals that can be tested with a kit are the sanitizer level (bromine, chlorine, or salt), the pH level, and alkalinity level of the hot tub. A liquid reagent is a substance that is added to a system in order to bring about a chemical reaction, or added to see if a reaction occurs. Liquid kits require measuring samples and counting a certain amount of drops of reagent. If the person doing the test isn't careful with their measurements or counts, the results may not be very accurate. Test strips work well and are easy to use. Hot tub owners would just need to dip a strip into the water at elbow length, and then read the results on the strip after waiting for at least 30 seconds to allow the colors to appear. Tablets come in packages which make it easy for a person to push through foil to get out and disperse into a test tube containing water from the hot tub. Once the tablet dissolves it will change the color of the water which will indicate whether anything needs to be adjusted at that time. Each type of chemical testing kit comes with a color chart (comparator) to compare the results to, either done manually or digitally, which will indicate whether any type of chemical should be adjusted at that time. If stored in a cool and less humid area, each kit should have a shelf life for up to 2 years. In order to be sure that the chemicals in your spa are well balanced, Hot Tub Warehouse recommends checking them at least two times a week. A hot tub owner should check it more often if the spa is being used more than usual. The best time to test your chemicals is at least an hour after use so that the water has had time to settle. It is best to not check the chemicals of your hot tub water on a stormy day as the results could be inaccurate. If ever in doubt of your results, wait a few hours and test the water again. If you need to add chemicals then it is best to recheck the chemical balance of your water at least 24 hours later, and certainly before the hot tub is to be used again so as to be sure it is safe.